I have an damaged PS4 mainboard. The HDMI port has been "pushed back" and in the process removed some components. I therefore need to know what exactly there was before the accident. Those are 2 capacitors and 2 diodes. The two diodes are the same and the 2 capacitors are the same. 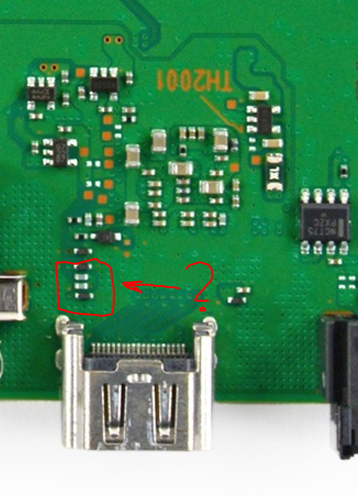 It's common to find one or more of these knocked off the board when the HDMI port has been pushed back and knocked off the board. I don't know the values of the resistors (I can check tomorrow when I'm at my shop if needed) but the diodes have the markings C2 on them. I have a bunch of parts motherboards and I could sell you these components if needed. I will check with my local dealer first but if I can not get what I need, I will return to you. OK. I'll do my best to remember to do this for you when I'm at the shop tomorrow. If I can not find them locally how do I contact you? Just here or? Tonz3r zal eeuwig dankbaar zijn.